We don’t know if it was “every Sunday evening,” but Brinkley in fact owned a giant fountain with interactive colored lights he controlled from a panel inside his house. We have seen the panel, which is still in the Brinkley Mansion, or it was as of 2009 when we visited. He also had a (rare and expensive) player organ inside his house and installed giant speakers so he could play the music outside. Eventually the Brinkleys installed a parking lot across the street from their house for all the cars bringing the onlookers. "It's prettier at night, because the two lighted fountains are turned on, a dozen colors changing all the time as lights are thrown on the water squirting 30 feet into the air. One has no difficulty knowing its owner. The name 'Dr. Brinkley is in large letters on the gates . 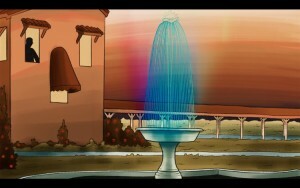 . . and the name flashes in neon on the fountains at night." (Millard Cope, San Angelo Standard-Times coverage of the trial, quoted in "The Case of Brinkley v. Fishbein," Journal of the American Medical Association, May 13, 1939, Volume 112, No. 19, p. 1952); "At night, the grounds were a fairyland. People came from far and wide just to sit in their cars outside the gates and watch the fountains shoot skyward thirty foot parabolas of water, while beams of light played on them in a dozen ever-changing colors." "The living room was where he relaxed. After dark, chandeliers of Czechoslovakian crystal flattered some 2,400 square feet of treasures, the largest of which was a cathedral-style, state-of-the-art pipe organ rising two stories high. (No musician, Brinkley hired away the organist at Grauman's Chinese Theater in Hollywood to play it for him" (Brock, 209). "The west wing contained John's pride and joy. Here, the devotee of organ music built a two story addition to accomodate an elaborate organ, which reached the ceiling of the lavish music room. The Reuter Organ Company of Lawrence, Kansas, specially built the music room and organ from March 1934 to February 1935. The organ freight bill listed its weight at 22,721 pounds..." (Lee, 187-189).